NOW IS THE TIME TO JOIN SHINGARI'S SCHOOL OF RHYTHM! 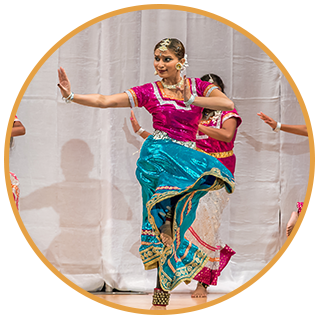 When it comes to our Bollywood dance classes, we incorporate traditional costumes into our performances. There are a number of pieces that are synonymous with Bollywood dancing, such as the beautiful silk saris and ornate jewelry. But one piece that gets a lot of attention are the ankle bells. These bells are called “ghunghroo” and they are very important to the art of Bollywood dancing. They enhance the dancer’s movement. Bollywood dancing incorporates a lot of movements with the feet and the legs. As the leg moves down and hits the floor, the bells ring out and act to enhance the dancer’s movement. They keep time to the music. Bollywood dancing is very rhythmic. The bells that a dancer wears can act as a sort of rhythm keeper to help them keep time to the music. It helps the musicians, too, because they can hear the movements of the dancers as well as see them. They add to the sensory experience of the dance. These bells are a benefit to the audience, too! The sparkly bells are a beautiful addition to the ornate costumes of Bollywood dance, so they are a treat for both the ears and the eyes as the dancer moves across the stage. If you would like to learn more about Bollywood dancing or are interesting in tying on a pair of your own ghunghroos, get in touch with us today! We have classes for all experience levels. Get involved with Shingari’s School of Rhythm today!